Amongst the most influential landscape painters of the early twentieth century, Margaret Stoddart distinguished herself as one of New Zealand's first professional women artists. Born in Diamond Harbour, Banks Peninsula, Stoddart attended the Canterbury College School of Fine Arts prior to furthering her studies in Europe. 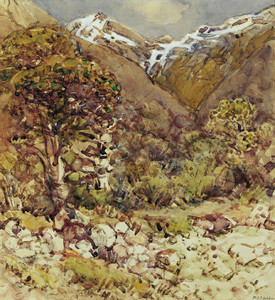 Painted during the 1920s when Stoddart was increasingly attracted to subjects that conveyed the unique character of the Canterbury region, Near the Hermitage, Mt Cook, is one of several major works she produced depicting the Southern Alpine region. Highly acclaimed for her independence of vision, Stoddart's Near the Hermitage, Mt Cook with its skilful modulation of tonal harmonies, broad impressionistic washes of colour, and calligraphic brushstrokes is an extraordinary example of the mature style that critics described as "pushing watercolour to dynamic ends."